Considering they’re very basic creatures, sea stars have some pretty amazing abilities (like regrowing their own leg if they lose one!) but they don’t normally travel hundreds of kilometres inland… until now. With a little assistance from Ocean Life Education, our Blue Linckia’s, along with the rest of our marine life menagerie, have temporarily migrated away from the coast to help students who rarely get to see the sea understand more about the challenges these animals face. In a road trip lasting 3 days and covering close to 500 kilometres, Ocean Life Education is making sure children in Blackbutt, Nanango and Kingaroy don’t miss out on the chance to touch and learn about our wonderful animal ambassadors. The Ocean to Outback initiative is supported by the State Government through its Advance Queensland Engaging Science Grant. Why go to such extreme lengths to facilitate these encounters? Oceans cover almost three quarters of our planet and produce more than half of the oxygen on earth while absorbing harmful carbon dioxide. Ocean currents also move such a large body water between the equator and poles, they help to regulate the global climate which impacts all of us – even those that live well beyond the shoreline. Keeping the oceans healthy is in everyone’s best interest. But travelling with a crew of sea stars, sea cucumbers, sea urchins, hermit crabs and a shark is not without its challenges as water quality and oxygen levels are vital to their survival, especially in the hostile bush environment. One thousand litres of salt water have been transported along with the animals to ensure they are stress free on their little adventure. But all the planning, all the logistics have been worth it just to see the excitement on the faces of a whole new batch of ocean lovers, who may rarely hear the waves crash or smell the salt in the air but know the importance of caring about the underwater world – even this far from the coast. 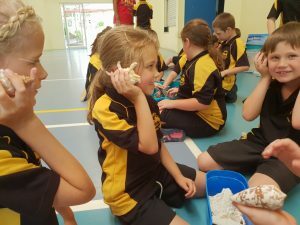 This entry was posted in Marine Education, Media, Schools and tagged advance queensland grant, incursions, marine education, ocean to outback, school incursion on November 6, 2018 by oceanlifeeducation.